In this Hotel Hell episode, Gordon Ramsay visits the Hotel Monticello in Longview, Washington, one of the oldest buildings in town but owner Philip is an alcoholic, he is constantly drunk and was charged with a DUI. Gordon arrives and is impressed by the hotel and the amount of rooms it has to offer but sees a lot of cars outside, a terrible advertisement. He goes in the hotel and finds out that all the cars belong to Philip. He also notes that the employee of the month has not been updated for 3 years. Gordon is not impressed with the state of the rooms and finds one room has been turned into a storage room. Gordon meets Ginger and Philip, he is amazed that the two are a couple. They tell him that they are losing $400,000 a year and this is due to the employees! Gordon goes to the restaurant and meets Debby the waitress. He orders ravioli which is awful and not home made. Gordon asks to speak to the chef, who tells him he gets 20 minutes prep time a week, has no control on the menu and Philip buys in the food. Gordon speaks to Philip about his DIU, he claims he doesn't know what's going wrong and it's clear he has been drinking today. During dinner most of the customers are elderly patrons and Gordon talks to the bartender who tells him that Philip drinks at least 10 drinks a day. Gordon takes Philip upstairs to a room and gets out a black light, there are stains everywhere and the room is filthy, Gordon tells them that they are ripping people off and don't care about anyone. Gordon introduces Philip and Ginger to some guests who have stayed at the hotel, their complaints are about how dirty the rooms are, wasted money and none of them would return. Gordon promises some treatment to help Philip with his drinking problem and tells Philip that if he doesn't change the hotel will fail. Over night the hotel is given a huge transformation, the motel sign is gone. The staff love the new rooms and Gordon tells them that they have the potential to turn their fortunes around. They will now be offering room service with a new menu with local ingredients for both this and the restaurant. In January 2014, the lounge and restaurant in the hotel was closed by the owners so they could pursue other endeavours. Reviews since Gordon's visit are mostly mixed on Trip Advisor, although some are disappointed about the closure of the restaurant and lounge. Philip was sentenced to 90 days in prison in July 2016 for threatening a District Court judge. In September 2016, the property was listed both for sale and lease online. It appears that Philip is no longer the owner as of early 2017 and the new owners have recruited new staff. There was a large multi million dollar remodel in October 2017 and the restaurant planned to reopen. Planning a visit to the hotel? Check out their website for further information. 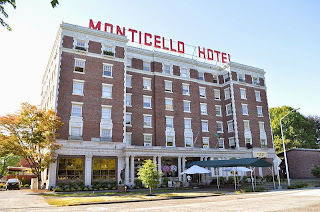 Monticello Hotel aired on July 28 2014, the episode was filmed in June 2013 and is Hotel Hell season 2 episode 2. He should have sold off the hotel in the first place. He's remarkably incompetent as an owner. Such a shame. Seemed like great employees and just some work could have made that hotel a wonderful place.